The United States ranks among the world?s top seven countries in economic gains from investments in information and communications technologies, but that may change within a generation if trends continue as revealed in a new report on the status of technology in the country?s classrooms. The World Economic Forum cites Finland, Switzerland, Sweden, Israel, Singapore, The Netherlands and the United States as early and ?enthusiastic? adopters of IT and notes that the sector thrived in these countries largely because of sound supportive regulation, quality infrastructure and a ready supply of relevant skills. But Education Week?s new ?Technology Counts? report on how grade schools are tackling technology training for teachers, use of digital tools and online learning needs concludes that technology is failing to reach its full potential in those schools even as new devices and software flood classrooms. Passive use of classroom computers has become more, rather than less, common, and professional development for the integration of technology in classrooms has remained flat. While the percentage of fourth- and eighth-grade students who report using a computer in math class at least once every few weeks has increased steadily over the past decade, those students still use their computers largely for rote activities like practicing and drilling math concepts rather than for tasks that require critical thinking, such as problem-solving, creating projects, and doing extensive research, the report says. Released in June, the 20th edition of ?Classroom Technology: Where Schools Stand? sounds an alarm that disparities in technology access, adoption, and the ways new tools are integrated into instruction may be fueling a new digital divide ?that threatens to exacerbate long-standing inequities and separate education?s haves and have-nots along new fault lines.? Kevin C. Bushweller, the annual report?s executive project editor, writes, ?Even though nearly all public school classrooms are now connected to the Internet (that figure was about 15 percent in 1997), problems and inequities persist. The quality of those connections varies widely from school to school and district to district; and how teachers use technology in their classrooms ranges from sophisticated, project-based learning to mundane skill drills ? largely dependent on the caliber of the technology and teacher training.? 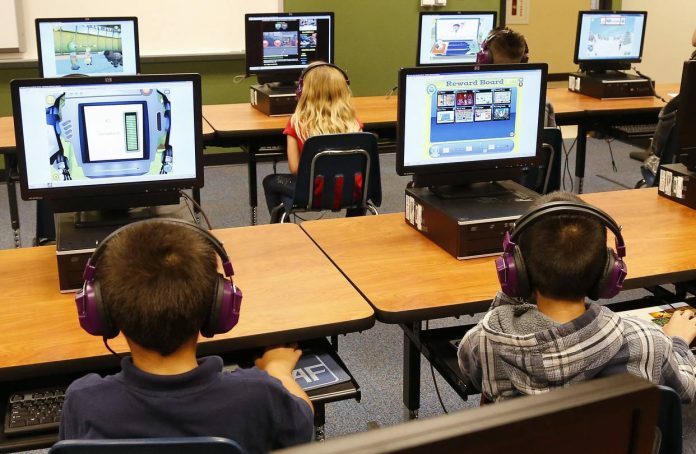 Most vulnerable are students in rural and low-income districts who already face a digital divide in access to reliable high-speed Internet connectivity and with teachers ill-trained in the use and integration of digital tools in classrooms. That divide could widen if the Trump administration eliminates the $39 billion federal E-rate program that helps schools and libraries pay for telecommunications services. With the administration?s change in leadership at the regulatory Federal Communications Commission, the uncertainty already abounds about future efforts to boost broadband access and preserve an open Internet. In 2015, just 61 percent of fourth-grade reading teachers said they had received training on how to integrate technology into their classroom instruction, a drop of 3 percentage points from six years earlier. Of the 61 percent, only 17 percent describe themselves as ?proficient.? Meanwhile, the number of laptops, tablets, netbooks, and Chromebooks shipped annually to kindergarten-through-12th grade schools grew by 363 percent, with more than 14 million devices shipped in 2015 alone against just over 3 million shipped in 2010. The share of fourth-grade math teachers receiving training on integrating technology into instruction in the past two years ranged from 59 percent for the highest-poverty schools to 69 percent for the lowest-poverty schools. With innovation increasingly based on digital technologies, these statistics spell bad news for a ?ready supply? of technology skills in the future. Even if teacher training improves, schools still face the deeper challenge of ensuring that educators receive the guidance and support needed to embed the tools fully and effectively into instruction and to align technology with students needs and learning goals, Education Week?s researchers say. If the United States is to maintain its standing among countries reaping huge economic gains from investments in IT, a greater portion of those investments will have to be allocated to education.